Hello from your resident Pibuu writer! I flew out to Los Angeles from New York this past weekend, and I thought, Hey, this will be a good chance for me to do that pre-flight, post-flight routine! — which was great in theory but, truth be told, didn’t actually happen — but I am still here writing this post. I went to JFK from the office and didn’t have time to do a pre-flight routine before I headed out because, well, work. The MTA was delayed (no surprise), so I got to the airport late, and there were only two TSA lanes open, and I just barely made it to my gate and on my flight because people kindly let me cut and go through security first. That meant I had zero time to do a pre-flight routine. I landed at one a.m. in LA and was too busy getting my puppy snuggles after months of being away from my dog, which meant … I did not do a post-flight routine … though I did do a full routine in the morning, which was only, like, five hours later — that’s still technically a post-flight routine! In the morning, I started as I usually do with a shower, cleansing my face using Glossier’s Milky Jelly Cleanser (my holy grail cleanser). Once out of the shower, I towelled dry, then spritzed Lagom’s Mist Toner liberally over my face — I’m not usually the biggest fan of mists, but I actually really love this one. The particles aren’t too fine, and the toner is cooling and hydrating, so my skin feels nice and balanced and hydrated. After liberally spritzing my face, I patted the toner into my skin then went on to sheet masking. A week or so ago, I’d done Abib’s Gummy Sheet Mask Milk Sticker and absolutely loved it — it’s a mask that sticks to your face and has been soaked not in an essence but in a cream, which makes it super hydrating and nourishing — so I opted for Abib’s Gummy Sheet Mask Heartleaf Sticker. It was hydrating and calming, just what my skin needed after a cross-country flight (and no skincare routines to speak of), and, because it sticks so closely to the face, I was able to cook some breakfast and feed my puppies bits of egg and ham while my skin soaked in the soothing essence. 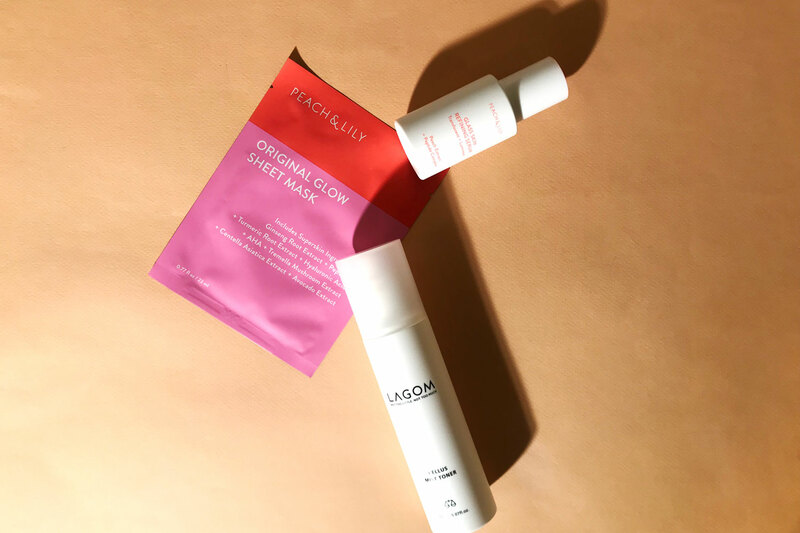 I always make sure to follow any sheet masking session with the rest of my skincare — I’m currently using the Peach & Lily Glass Skin Refining Serum and the Krave Beauty Great Barrier Relief as treatments. After watching Alicia, my boss, demonstrate her facial massage technique at the launch event for our Power Calm Hydrating Cleanser a few weeks ago, I’ve been taking the time to give myself a short facial massage every time I apply the Glass Skin Refining Serum. Finally, I finished my “post-flight” routine by sealing everything in with the Peach & Lily Matcha Pudding Antioxidant Cream, which always leaves my skin dewy but also matte, and, of course, followed that with a sunscreen I’m currently testing. LA is drier than New York, and I always feel like I’m kind of shriveling up when I’m there. It was also super windy in my parents’ neck of LA, so, to compensate for that extra dryness, I also did a hydrating sheet mask every day I was in town (it was only four days) to make sure my skin got the hydration and nourishment it needed. I took the Peach & Lily 3 Sheet Mask Set with me because I wanted sheet masks with a lighter, refreshing, hydrating essence — sometimes, if I do too many sheet masks with a heavier essence, my skin will start to break out. As usual, I always followed my sheet masks with the Glass Skin Refining Serum, Great Barrier Relief, Matcha Pudding Antioxidant Cream, and a sunscreen. The daily sheet masking really helped keep my combination skin hydrated and healthy; I don’t know that my skin has ever been this soft before (not counting after an intensive facial). Before my red-eye back to New York, I again … did not do a pre-flight routine; it was more important to get as many puppy cuddles as I could. I also did not do a post-flight routine once I got to my apartment in Brooklyn at six a.m., collapsing in bed instead for a short nap before getting ready for work. Later in the day, though, at the office, I went through my routine — cleansing with the Power Calm Hydrating Gel Cleanser, toning with our Good Acids Toner, and doing one of our Original Glow sheet masks, which helped reset, calm, and nourish my tired skin after an exhausting red-eye. As usual, I followed up the sheet mask with the Glass Skin Refining Serum (applied with a short facial massage), the Matcha Pudding Antioxidant Cream, and another sunscreen I’m currently testing, and my skin has been the happiest it’s been after traveling — so I suppose the point of all this is that, sometimes, it’s hard to do your pre- and post-flight routines because of life and because your flight lands at a terrible hour, and that’s okay. No one here’s going to shame you for not being obsessive about your pre- and post-flight routines. Just make sure to do them as soon as you’re able and to take into account the environment of wherever you are or will be, so your skin stays healthy, hydrated, and happy!